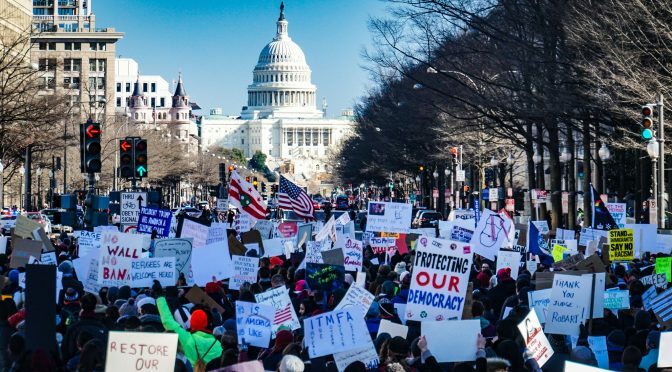 In this issue, we’re looking at the explosion of what is being called ‘the resistance.’ The vast proliferation of organizing in the face of President Trump raises important questions Should partisans inside the Democratic Party wage a fight between its left and it’s center, or combine forces? Does the proliferation of new efforts represent genuinely innovative projects, or does it mask a great deal of overlap and wheel reinvention? Should the main target of organizing be Trump and the Republicans, or broader, systemic obstacles that include casino capitalism? Finally, what does it mean that the largest, most powerful progressive institutions – such as organized labor – don’t seem to be at the forefront of this resistance? Today’s issue includes a piece written for the newsletter by Tom Gallagher on the strategic options confronting the left within the Democratic Party; an article by Micah Uetricht soon to appear in the May issue of New Labor Forum assessing the Sander’s inspired Our Revolution as well as various snapshots of what this resistance is looking like in the current moment, including the breaking news that a major local of the Service Employees International Union as well as a multitude of workers centers plan to participate in a May Day strike. This year, International Women’s Day (March 8) is being celebrated in the U.S. at a higher pitch than usual. The election of Donald Trump has led to an upsurge in organizing and activism. In the last few months, we’ve witnessed the massive Women’s Marches in cities all over the country and, indeed, the world; a February 16th Day Without Immigrants and a less successful call for another general strike on February 17th; and the current call for a global women’s strike on International Women’s Day. This newsletter opens with an informative and lucid overview by Diane Elson of the current global state of gender inequality, as well as policy recommendations to remedy the crisis. Elison’s article is provided here as a coming attraction to the May 2017 issue of New Labor Forum. The issues she raises form part of the animating spirit of the call for a Women’s Strike on March 8., organized by a coalition of women working closely with the venerable Global Women’s Strike, an international organization that has existed since 1972. Here we also offer the link to the promotional video for the strike. General strikes, or days of action that are meant to resemble a strike, are gaining in currency. An example of recent experimentation with a general strike was the February 16th ‘Day Without Immigrants’, described here by Dan DiMaggio and Sonia Singh in Labor Notes. NLF editorial board member Nelson Lichtenstein addresses the meaningful difference between ‘weekend protest’ vs. ‘weekday strike action’ and why it matters, in No More Saturday Marches, published this week in Jacobin. We also include Francine Prose’s essay in The Guardian, offering a full-throated argument for the general strike as a tactic. And we close with Alexandria Neason’s meditation in the Village Voice – Is America Ready for a General Strike? Women of America: we’re going on strike.